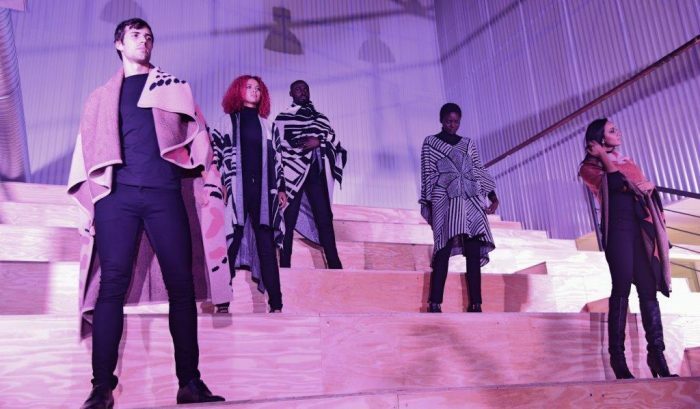 Local luxe boosted as Africa’s first-ever cashmere producer launches debut collection. You are here: Home / Business / MyPR / Local luxe boosted as Africa’s first-ever cashmere producer launches debut collection. Johannesburg, 27 February 2017- Ivili Loboya, an innovative textiles producer based at Ibika, near Butterworth in the rural Eastern Cape, is launching a first for Africa at the Impact Hub in Rosebank, Johannesburg, from 23 to 25 February. Among the yarns produced by the company is Africa’s first-ever indigenous cashmere, produced from the local iMbuzi goat. This yarn is showcased in a variety of fabrics, including blends with silk and merino wool, as Ivili Loboya’s debut Dedani Collection. Eco dyes from natural sources such as leaves, fruits, bark and flowers have been used to create the collection’s palette of warm, earthy tones. These include ochre, bone, nut, marula, wild peach and pitch. The Dedani Collection’s proudly indigenous luxury fabrics range from handspun and woven to hand knitted or machine-made, and are printed according to three design themes. Under the Clan theme, the main designs are Totem, an abstract presentation of natural objects and animals that reference spiritual ancestral connections, and Tyali, celebrating the Xhosa Makoti or bride and the fertility of the clan. The Earth theme combines references to the dichotomy of drought (Mbalela) and waterfalls (Amanzi), evoking the farmer’s reality and climate change. The Ethnic theme evokes and celebrates humanity’s common heritage through its interweaving geometrics and the cultural fusion of Ndebele and Xhosa traditional designs. The initiative also has considerable support from textile, industrial and policy sectors. Minister Jeff Radebe gave a launch address on 23 February attended by well-known designers like Marianne Fassler, Laduma and others. Cashmere is made from the soft, fine inner hair of the goat’s coat. Originally, the term was applied only to goat hair from the Kashmir region of the Indian subcontinent but usage has since broadened to all goat hair that is similarly fine and soft. Cashmere is in great demand for luxury fabrics from suiting to upholstery. At its vertically integrated wool-processing hub, Ivili Loboya – meaning “Wheel of Wool” – offers wool-sorting and scouring, fibre manufacturing and handspun yarns. It also supplies insulation and inner soles for safety shoes. Fibres are sourced from small farmers, many of them women. It has trained employees in spinning, weaving and knitting as well as machine production. Senior staff and management are mainly young people with bachelor’s and master’s degrees in subjects such as textiles and engineering who are keen to live and work in their home region rather than migrate. The company collaborates with the Agricultural Colleges and the Materials Science and Manufacturing Unit of the Council for Scientific and Industrial Research (CSIR), among others. Dr Mahlati’s doctorate at the University of Stellenbosch focused on commercialisation and mainstreaming of rural economies through value chains. She also has experience at the retail end of fashion, having owned a designer boutique. Ivili Loboya is a natural fibre (wool & cashmere) beneficiation enterprise for woven and non-woven textile products. It is Africa’s first and only commercial cashmere production facility. Ivili Loboya offers futuristic Eco designs in energy-saving insulation products with sound absorption capacity for homes and industries. Ivili Loboya’s footwear inner soles from natural wool are made to the highest standards in the industry. The Ivili Loboya Wool Processing Hub is a 3 500 square meter (11 483 sq ft) facility based at rural Ibika, near the town of Butterworth in the Eastern Cape Province, South Africa. The establishment of the factory marks the revitalization of Butterworth, with economic transformation driven by highly experienced industrialists, global researchers and market specialists.